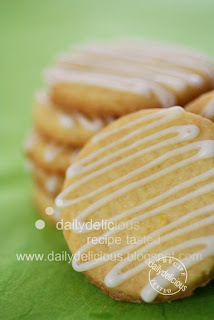 dailydelicious: Lemon Biscuits: Easy and delicious cookies, that I want to share! 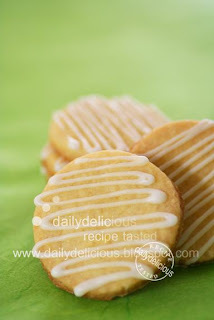 Lemon Biscuits: Easy and delicious cookies, that I want to share! I always have lemons in the fridge, because it's like the basic ingredient for the baking. But there are many times which I was too busy (with my work, well, I'm not lucky enough to bake for living) and I had to find the recipe to use it, as I don't like to waste anything. This time the recipe that comes to save my life come form The Olive magazine Issue: February 2010. Talking about the magazine, I really like this one. There was a time that I just couldn't resist it, I buy 4-5 magazines per month (well, they are good but it's too much I never had enough time to try the recipes from them). So, I try to change, I just read it before buying it (^ ^, so, now you know that most of the time I just grab them from the shelf and pay>*<, no browsing just paying, very bad habit). But this one is still the one that I buy almost every month, I like the photo (the style of the photo is great, and very modern), I like the easy recipes which I never disappointed. There is another magazine from the BBC, that my friend's very crazy about, the BBC Good Food, she's really love it. But for me Good Food is great but I still like Olive more. If you like cooking or baking, you know that food magazine is a good way to give you the inspiration. I love to read about the new trend in cooking or baking market (I think, because I have blog about baking so I'm in this business too, I have my mission to show you some great baking trend, haha). Anyway, the thing that I really get from all of my magazine is the good recipe to share with all of you, and hope you like it too. 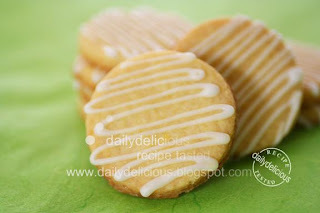 And this time the recipe that I want to share with you is the lemon biscuits, it's very easy to make, because this time you don't have to use anything much, only the food processor. Just pour everything into the machine, step by step, roll and cut, then bake, and you get the tangy sweet (and delicious) cookie, ^ ^ fresh from the oven. 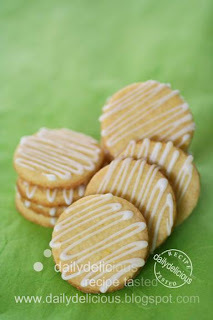 The Lemon icing is easy to make too, it makes the cookie looks lovely and more yummy. After baking and drizzling with the icing, it's your decision that you want to keep them for your own tea time treat (^ ^, I know that you consider this one first), or give it to your friends or any people you love, well, 60 cookies is a lot, so sharing them with other people is my suggestion, and they will love you much much more, haha. Preheat the oven to 180°C. Line the baking sheet with the baking paper or silpat. Put the flour, and butter into the bowl of the food processor, and process until breadcrumb like. Put the lemon zest, egg yolks, sugar and lemon juice into the bowl and process to a combine. Pour the mixture onto the working surface, and press them together. Roll the dough to 5 mm thick. Cut the dough using 4.8 mm round cookie cutter. Sift the icing sugar into a bowl, and mix with enough lemon juice to make a runny icing. Drizzle the icing over the cookies. Wow...looks yummy! Lemon is a must-have in my kitchen too. Thanks for sharing this delicious recipe, just reminded me that I still have half a dozen of unused lemons in the fridge...heh. 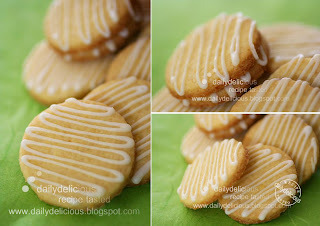 Wor, i like this, something sour in cookie, I might do this for coming Chinese New Year. Thanks for sharing. Perfect! And in my favourite flavour too. The simple icing makes a huge difference. They instantly prettify the biscuits! Hi Pook, I really like your blog very much and I look forward to see new recipes from you everyday. I would like to know whether coffee is needed to make the Berry Coffee Cake because I noticed there isn't any coffee mentioned in it. Thanks a lot for sharing all the wonderful recipes and I am beginning to look at the recipes books you have collected over the years. It's not hard to do it, just press the dough and they will be smoother, that's all. i tried to bake this biscuit yesterday but to my dismay, the dough turn out to be wet and sticky. Making the shaping of the biscuit so difficult! i cannot rolled/flatten it as it is so wet. what is wrong? i followed your measurement. May I ask about the protein contain of your flour, ^^. Because if the dough turns sticky, the problem can come from the moisture, the low protein flour will hold less water than higher one. Hi, may I know what is the protein content we are suppose to use? My dough always turn out to be sticky and wet too. Even for those shortbread cookies. Thanks. My flour has medium protein contain about (10.5-11%). But if you find it too sticky you can add more flour, because each flour can accept liquid differently too. Tried them out.... absolutely delicious. Even a girl friend of mine (whose culinary skills make me jealous all the time) commented on how yummy they were. Thank you. Hi! 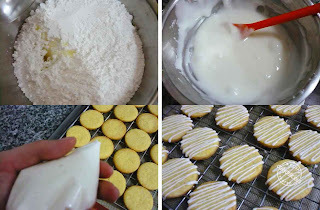 I just wanted to say that I love your blog and I also have a question, is there a way for me to make these biscuits without using a food processor? Can I just use a hand mixer, or is there another method? Hi, Can i know what brand of multi purpose flour you are using for most of your cookies?